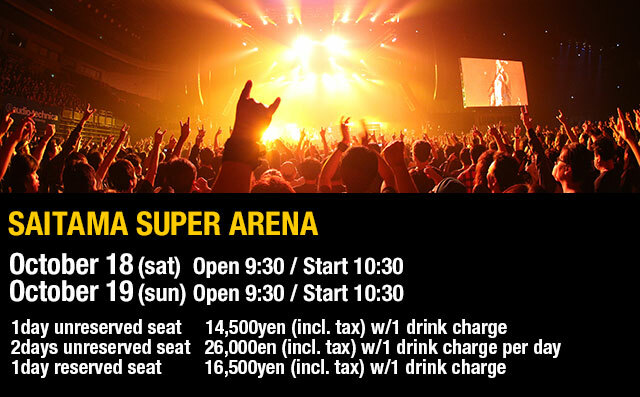 Loud Park tickets are now available via Rakuten Tickets! *Please read "IMPORTANT REMINDER FOR CUSTOMERS @Loud Park" below this page before you purchase your tickets. *For customers who live in Japan can also purchase Loud Park tickets at Rakuten Tickets, along with other vendors shown in the “Tickets” page. *The Artist Line-up is subject to change. *Absolutely no refunds for line-up changes or any artist's cancellations. *Any children under 7 must be accompanied by parent or guardian. *Admission may be restricted on each stage due to over capacity. *Performance days and/or stages assigned for Artists are subject to change. *Cooling boxes, mats, cans, bottles and flammables (e.g. fireworks) are prohibited. *Plastic bottles are allowed to bring inside the building facility, however NOT allowed to bring them into the venues where the actual performances are to be held. *Ticket is required for anybody who is older than 5 years old, and per child under 7 years old must be accompanied by at least by one adult, a parent or a guardian, and there are certain areas children cannot enter. *Tickets are only valid on the day(s)/venue(s) printed on them.